A thorough and standard work in the field. Isaac Todhunter (1820-1884) gave a close and carefully reasoned account of the difficulties involved and the solutions offered by each investigator. His studies and use of source materials were thorough and fully documented. His reputation rests on the contribution he made to the history of mathematics. by G. R. Kaye - Thacker, Spink & Co. 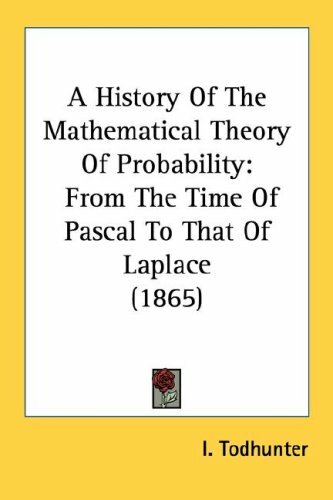 This book covers the history of probability up to Kolmogorov with essential additional coverage of statistics up to Fisher. The book covers an extremely wide field, and is targeted at the same readers as any other book on history of science. History and tradition know Archimedes almost exclusively as the inventor of a number of ingenious mechanical appliances. Few have any acquaintance with the details of the original discoveries in mathematics of the greatest mathematician of antiquity. The book chronologically traces the Pythagorean theorem from the beginning, through 4000 years of Pythagorean proofs. The text presents some classic puzzles, amusements, and applications. An epilogue summarizes the importance of the theorem.